Big news from Denver as the Broncos are not expected to re-sign running back Knowshon Moreno. Montee Ball dynasty owners need to plan accordingly. Ball came on strong down the stretch and proved he can handle the load. With at least one year in a Peyton Manning offense, Ball could flirt with RB1 status in 2014. Lions running back Joique Bell claims there’s interest on both sides for a long-term deal. Bell came on strong in place of an injured Reggie Bush throughout the season with over 50 catches and over 1,000 yards from scrimmage. A deal would be good news for Bell but would significantly hinder Reggie Bush’s dynasty value going forward. New Redskins offensive coordinator Sean McVay loves his new tight end Jordan Reed. This will only enhance Reed’s value heading in to 2014. As a sufferer of a severe concussion last year, Reed’s health needs to be monitored especially playing such a busy position. A crowded backfield in Philadelphia could mean someone is on the way out, according to a Philadelphia blog. Additionally, with both Chris Polk and Bryce Brown being on the roster before Chip Kelly’s tenure started, the same blog suggests he could find one better suited to his offense in the draft or free agency. Stay tuned as this looks like it might be a fluid situation. Bears defensive lineman Shea McClellin is being converted to a strong-side linebacker. Maybe this will salvage some value out of McClellin who has been a huge disappointment as a lineman his first two years. Ravens running back Bernard Pierce had rotator cuff surgery and will miss the next 4-5 months. The recovery will impede his ability to get acclimated to new offensive coordinator Gary Kubiak’s system. Pierce was one of the bigger disappointments after averaging 2.9 YPC last year after a terrific rookie season. If the Texans offense is any indicator, Pierce would play the Ben Tate role to Ray Rice’s Arian Foster – if he can stay healthy. I have to keep four of the following: Dez Bryant, Demaryius Thomas, Josh Gordon, Aaron Rodgers, Julius Thomas, and Giovani Bernard. Is it dumb to keep Rodgers and all 3 WR? Keeper league (keep 4), 10 teams. Non-PPR with 6 points for any kind of TD. Starting roster is 1 QB, 2 RB, 2 WR, 1 TE/WR, 1 TE, DEF, K.
First off, how you managed to get all those guys is incredible and in a 10-league team no less. Kudos to you. Giovani Bernard will be a good running back but the position is one of extreme turnover. Additionally, with your league being a non-PPR, Bernard’s best asset (pass catching) is neutered. Not keeping him is an easy call. Next, let’s look at the three receiver set you accumulated. Every dynasty ranking will have Bryant, Gordon, and Thomas as top five wide receivers. Using any two of those three will give you an advantage over every other team in your league. All three are young (26 or younger) and are the focal points of their respective offenses. Bryant and Thomas play with elite quarterbacks and Gordon did amazing things with some of the least production at the position in the entire league. Unless someone managed to get Calvin Johnson and AJ Green together, you’ll always have the advantage. Furthermore, by process of elimination, that third receiver will be better than any flex option a team may have after filling their own WR and TE requirements. Those three simply can’t beat. 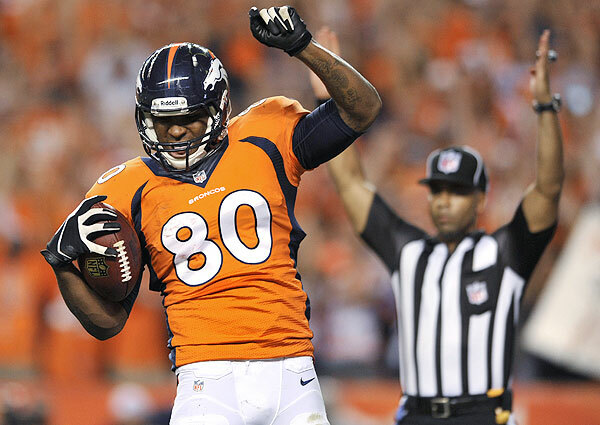 Which brings us to decision time: Aaron Rodgers or Julius Thomas. For man years, Aaron Rodgers has been the top quarterback in dynasty leagues. However, with the emergence of Eddie Lacy after Rodgers’ collar bone injury, it’s fair to wonder if the Packers might shift more towards the run. They will never be a run-first team but might want to utilize Lacy in order to lessen the load on Rodgers. For dynasty owners, this means less production than they’re used to from the Packers quarterback. Meanwhile, Julius Thomas could make a case for the 3rd best tight end in dynasty leagues. He plays on a top-rated offense with an elite quarterback with one of the receivers he shares targets with (Eric Decker) possibly leaving via free agency. Also consider the depth at each position. The differences in the best quarterback and the 10th (approximately 150 points in my own league) compared to the differences between the best tight end and 10th tight end (nearly 200 points) show that it would be a lot easier finding a replacement for Rodgers over Thomas especially considering your league only starts one quarterback. So there you have it. While you certainly can’t go wrong with your original strategy of Rodgers, Bryant, Thomas, and Gordon, you might also consider keeping Julius Thomas. Hope this helps and keep the questions coming! Apparently the Patriots were interested in trading for Cardinals receiver Larry Fitzgerald last year and, presumably, would still be interested. It was shoot Fitz’s dynasty value back up after falling for a few years now. The biggest obstacle is his $18 million cap number. Stay tuned. We now have some insight as to why Broncos rookie running back Montee Ball didn’t start immediately – it was simply overwhelming. As Ball alluded to, it’s a big leap to go from a college playbook to a Peyton Manning playbook. But as any Ball dynasty owners know, Ball was handed more responsibility as the year went on and could possibly be a starter in 2014 with Knowshon Moreno becoming a free agent. Either way, Ball is in for a bigger 2014. The Cardinals are making tackle Breanden Albert their biggest priority this season. If they land him, every Cardinals offensive player will get a slight bump up, especially in the running game. Chargers linebacker Manti Te’o had foot surgery to clean up the injury that plagued him early in the season. Hopefully, Te’o can head into 2014 healthier than last year and prove the Chargers were right in drafting him in the second round. New Ravens offensive coordinator Gary Kubiak expects tight end Dennis Pitta to be a big part of the offense in 2014. Any hope you had of getting Pitta on the cheap is now probably gone. Seahawks defensive end Michael Bennett had 8.5 sacks this season despite playing in a rotational basis and just 711 snaps. He’s playing on a one year deal and has earned the chance to test free agency again. Unless the market dries up like last year, an unlikely scenario now that Bennett has a good track record, chances are Bennett gets a bigger opportunity somewhere else. He’ll make an intriguing DL1/2 pick in 2014 dynasty leagues. Eagles quarterback Matt Barkley heads into the off-season as the probable backup to Nick Foles. It’s some good news for folks that drafted Barkley with hopes in dynasty rookie drafts last year. Saints running back Pierre Thomas is the most likely running back to be cut in New Orleans this off-season. It’s good and bad for Thomas since he could get the opportunity for more touches but also will miss being in one of the more explosive offenses in the league. Expect impressive second-year back Khiry Robinson to get more carries.